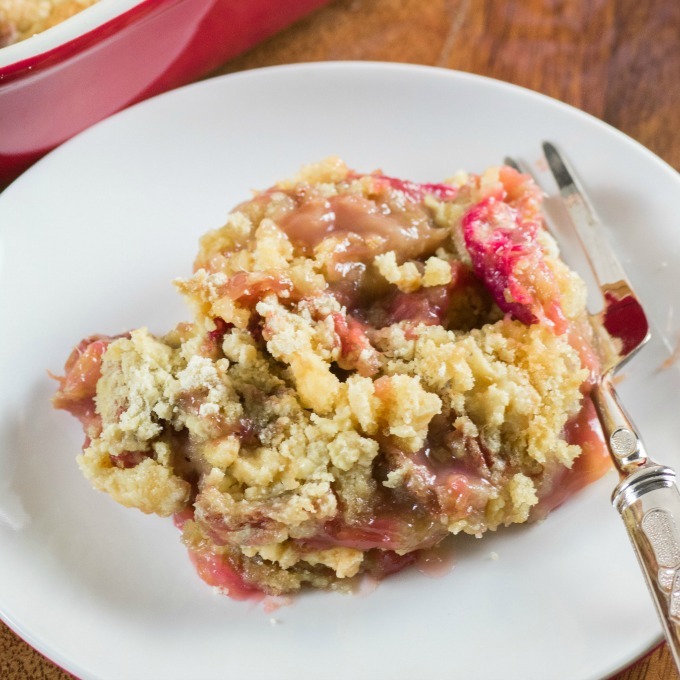 Are you like me and have a pile of rhubarb in the freezer from when you harvested it last fall? Some years after already baking in the summer I still have 25 cups or so that get stowed away in the freezer. 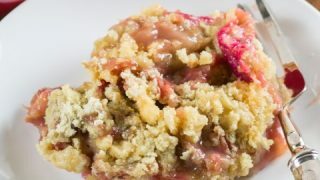 I wanted something easy to make so with some research I made this super simple Rhubarb Dump Cake. Our rhubarb patch does very well and we have numerous stalks each year with a wonderful deep ruby red color. This makes for such wonderful desserts. I have made a cake similar to this called a Blueberry Breakfast Cake where you dump the fruit into a 9×13 inch baking dish and put a batter on top. The blueberry cake you actually make up a batter and pour it over. 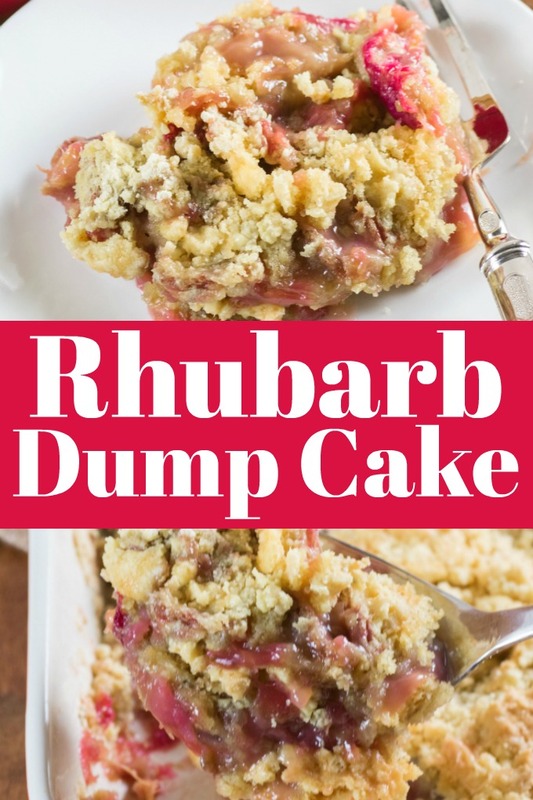 This Rhubarb Dump Cake recipe is even easier than that where you add the fruit, sugar, dry cake mix, water and melted butter. 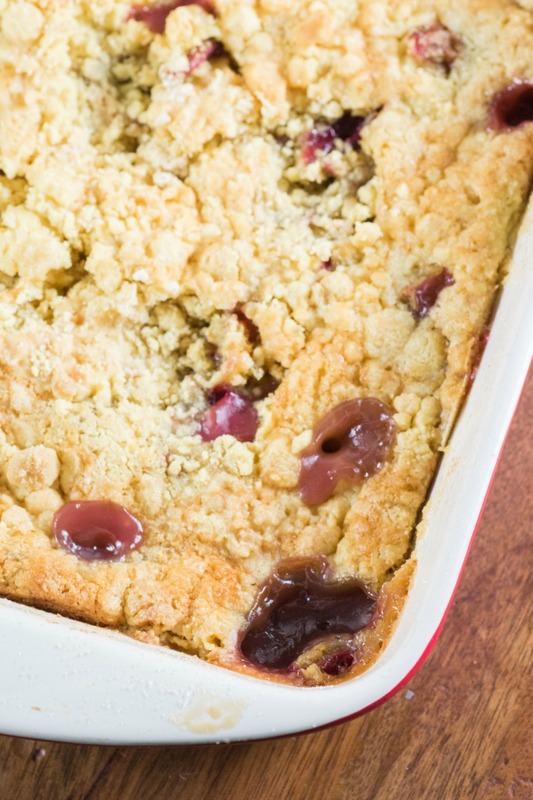 The end result is something like a crisp or cobbler. Very cool! I saw many recipes that asked for jello but I thought no way, that is going to be too sweet on top of the other ingredients. I didn’t need color either for my rhubarb so I omitted that. So I decided to go without the jello for my recipe and I am so glad I did. Not too crazy sweet as the tart rhubarb balances it very nicely. This is such an easy and delicious recipe. You have nothing to loose. 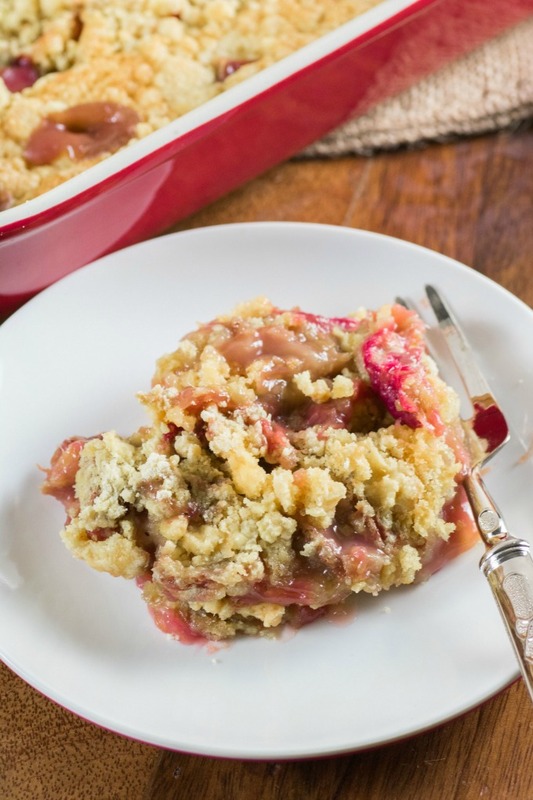 What Desserts Can You Make With Rhubarb? We have loads of desserts using rhubarb on our site. It is such an easy ingredient to work with! Once you start to grow a plant or two you have a nice harvest every year and they take very little care. Maybe just the occasional water, they really just grow like a weed on their own. Here are all of our wonderful rhubarb dessert recipes and one cocktail recipe too! 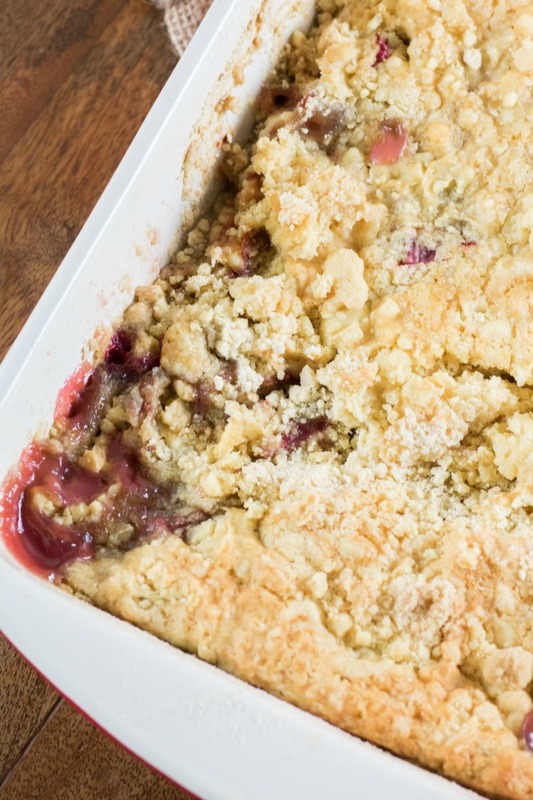 How Do You Make a Rhubarb Dump Cake? 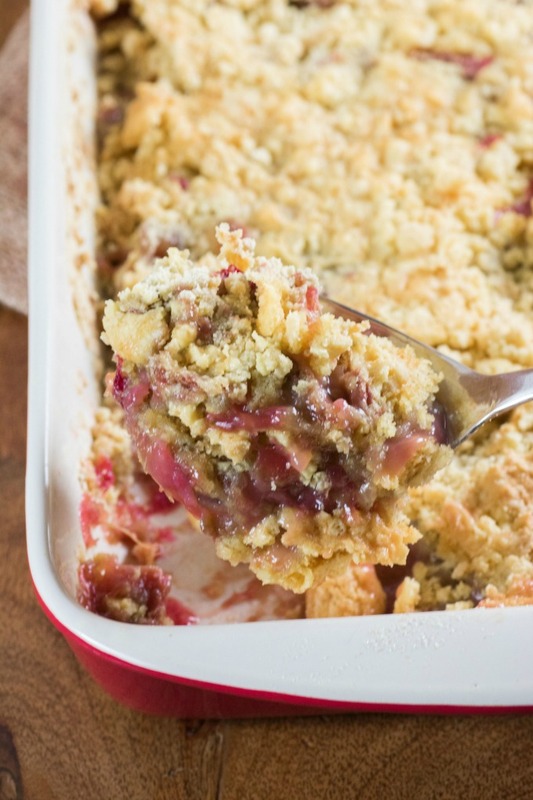 We are talking as simple as it gets in making the rhubarb dump cake. 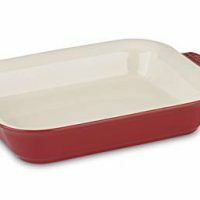 To make a rhubarb dump cake all I did was spray a 9×13″ pan with cooking spray. I then added in the frozen fruit, in this case rhubarb. I sprinkeld the sugar over the rhubarb and then followed that with the dry cake mix. You then sprinkle the cake mix with water and then melted butter. Trying to evenly disperse all the ingredients. What? No mixing, yup that is correct. 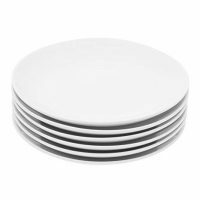 Do not mix it but put it directly into a preheated oven. You can add fresh fruit also to make this, it doesn’t have to be frozen. Serve this dessert warm with a scoop of vanilla ice cream or fresh whipped cream. I love how the fruit bubbles up through the crust. This is so yummy you won’t believe it. I liked the yellow cake mix for this recipe as opposed to a white cake mix to give it the warm contrast in colors. Grab some of your frozen fruit and bring summer to life again in this easy dessert!! This recipe could not be easier to make. It turns out more like a crisp than a cake but is heavenly with rhubarb. Preheat oven to 350F. Spray a 9x13" pan with cooking spray. Add the rhubarb and spread out evenly on the bottom of the pan. Sprinkle over the sugar followed by the cake mix. Pour over the water and melted butter evenly. DO NOT MIX! Bake for 45 min. until bubbling and the rhubarb is tender and the top is slightly browned. That looks so good! 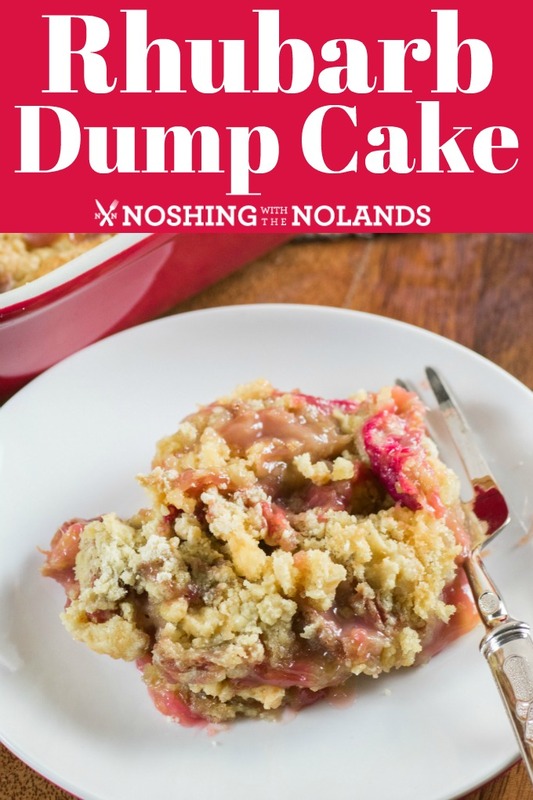 I love rhubarb in baked goods, and it doesn’t get easier than dump cake! 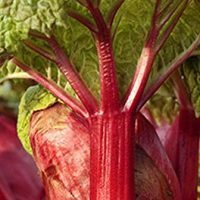 I have never made anything with rhubarb, this sounds delicious! I love how easy dump cakes are. I’ve never had rhubarb but would be interested in trying it. I think this cake would make for a tasty introduction! This is definitely going to be a good dessert for Spring. I love that rhubarb flavor and this sounds super easy. I still have yet to try rhubarb!! I need to make a batch for my family to see how they would enjoy this fun root! This recipe looks amazing. I could really go for this right now. I’ll have to get all the ingredients so I can make it soon. This looks really good. My husband loves anything with rhubbarb in it. We get it from his grandfather every year. This looks good! I have never tasted rhubarb. I’m kinda scared of it, lol. I’ve always wondered what something like Strawberry Rhubarb tastes like, but then I’m worried I’ll hate it, which seems ridiculous, lol. What does it taste like? Good question. Rhubarb is kind of hard to nail down for flavor as I find it is unique on its own. Raw and by itself it is very tart and crunchy like celery. As a child I loved to get a raw stick and a small bowl of sugar and find a cool spot under a tree and dip and munch away. The leaves are highly poisonous so you don’t want to eat those. Once sugar is added to rhubarb as in a dessert it takes on a whole new flavor and I would akin it to a Granny Smith apple. Rhubarb on its own is fantastic or pairs beautiuflly with berries like strawberries or blueberries. I have tons of Rhubarb as did my Dad. It is beautiful and the best fertilizer horse manure. But you have to let it sit for a year so it doesn’t burn up the plants. I will stand out there and pull a stalk and eat it raw. Love it no matter what ya do with it. You either LOVE it or HATE it. I freeze a lot every year for dump cake, Pie, Crisp, and I make a lot of rhubarb sauce and freeze that. Have eaten my whole life. I haven’t had rhubarb cake in a long time. This looks amazing, I want some! I love the taste of rhubarb. a friend grows it and every year she gives me a huge bag of it to use to make recipes with. I will have to try this out.